There is great uncertainty within our industry at the moment and many people have been affected by the dramatic cut of activity in the market. And although it can be difficult to be optimistic and have belief in the oil industry during recessions such as this, CRE8 is convinced that there will be a marked for oil activities for a long time to come. The industry has many times before shown that we have a unique ability to adapt to the market, and from the response CRE8’s flexible and standardized systems has received, there are every reason to be optimistic about the future. The important issue is to secure a cost level that is profitable even with the current price of oil. 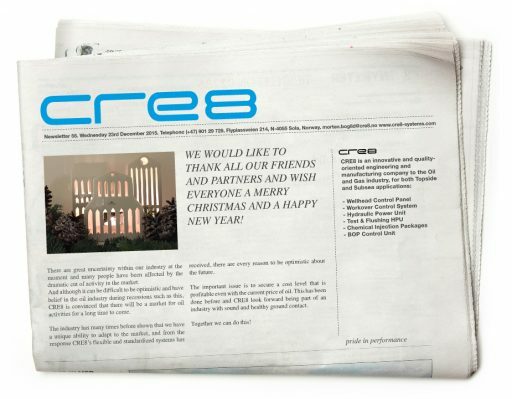 This has been done before and CRE8 look forward being part of an industry with sound and healthy ground contact.